SCUBAPRO'S FLAGSHIP REG SYSTEM For divers who want the best. With th.. THE PERFECT PAIRING FOR HARSH CONDITIONS New-evolution diaphragm first stage and premium all-me..
A STAND-OUT ALL-PURPOSE REG SYSTEM SCUBAPRO's best-selling air-balanced second stage and it.. The new MK17 EVO is SCUBAPRO's premium high performance balanced diaphragm first stage. Engine..
STELLAR BREATHING PERFORMANCE, OUTSTANDING RELIABILITY The ultimate go-to air delivery ..
ENVIRONMENTALLY SEALED FOR TOTAL PROTECTION The ideal system for cold water or harsh conditions.. COMPACT, USER-FRIENDLY, AFFORDABLE The perfect reg for divers seeking solid performance in an u..
SCUBAPRO teams its high performance titanium first stage with a brand new airbalanced second stage. ..
FIRST STAGE ◊ Air balanced diaphragm design delivers constant and effortless airflow unaffected .. 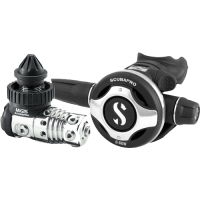 This reg system combines SCUBAPRO’s premium diaphragm first stage with its most compact second..